Home / SkinCare / Conscious Skincare - Conscious Man Body Wash And Lotion. Conscious Skincare - Conscious Man Body Wash And Lotion. 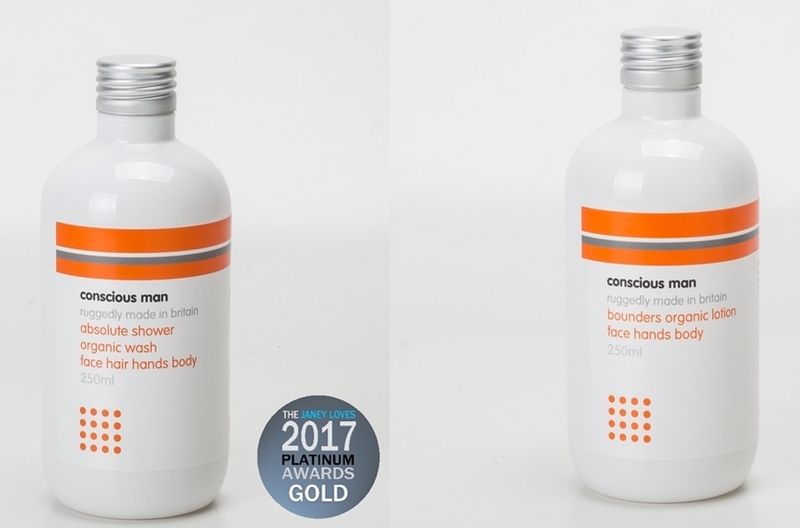 The Conscious Skincare set, Conscious Man Body Wash And Lotion, is suitable to use everyday whilst looking after your skin and improving its overall appearance. The brand new Absolute Shower men's body wash has been formulated with natural castile soap and contains a number of active ingredients to help cleanse and condition both skin and hair, so u don't have to use two separate products. Carefully blended with a number of wonderful essential oils including Amyris, Bergamot, Cinnamon and Frankincense, the scent is uplifting and natural. Skin moisturising jojoba oil will help nourish your skin thanks to it being rich in Vitamin E and d-panthenol helps to soothe dry skin by retaining moisture deep within the skins tissues. aqua, decyl glucoside, xanthan gum, aloe barbadensis leaf juice powder, citric acid, benzoic acid, dehydroacetic acid, organic simmondsia chinensis oil, d-panthenol, phenoxyethanol, cinnamomum zeylanicum leaf oil, amyris balsamifera oil, vetivera zizanoides root oil, pogostemon cablin oil, citrus aurantium bergamia oil, salvia sclarea oil, artemisia vulgaris herb oil, eugenia caryophyllus flower oil, pelargonium graveolans oil, boswellia carterii oil. Applying the Conscious Skincare Absolute Shower Body Wash to wet skin, you will notice the luxury scent and slight foaming of the body wash from all the natural ingredients. You can be assured the Absolute Shower Men's Body Wash is also completely free from synthetic preservatives, sodium laureate sulphate, parabens or phtalates. Skin is left clean without being stripped of its natural moisture and hair felt moisturised with the luxury scent being detected throughout the day. 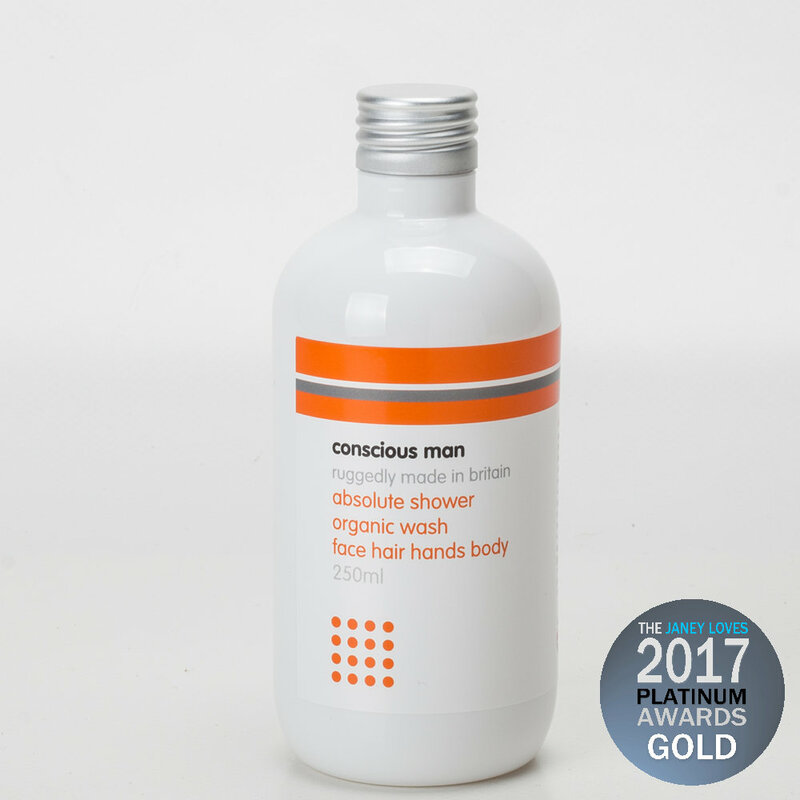 The body wash is suitable for all skin types and was awarded a fantastic ‘Gold’ in the Janey Loves Platinum Awards 2017 in the Men's Category. It was chosen from a record number of entries! After showering or bathing your skin is ready for the application of the Conscious Skincare Bounders Organic Lotion, Men's Body Lotion. Containing skin benefiting organic Coconut Oil to assist in skin hydration, organic Sunflower Oil to keep moisture retained and Apricot Kernel Oil to aid softness and suppleness, the body lotion is a soothing moisturiser for all skin types. Essential oils are added for their benefits which are, Amyris essential oil brings a sense of calming which in turn helps to reduce stress, Cinnamon oil assists with skin circulation, Frankincense essential oil has a number of benefits for your skin including toning, lifting and anti-aging. aqua, coconut oil (cocos nucifera)*, sunflower (helianthus annuus) seed oil*, cetearyl alcohol, coco glucoside, butyrospermum parkii (shea butter)*, xanthan gum, prunus armeniaca kernel oil*, phenoxyethanol, aloe vera leaf juice powder (aloe barbadensis)*, citric acid, tocopherol, lactic acid, benzoic acid, dehyroacetic acid, lavandula angustifolia oil, cinnamomum zeylanicum leaf oil, amyris balsamifera oil, vetivera zizanoides root oil, pogostemon cablin oil, citrus aurantium bergamia oil, salvia sclarea oil, artemisia vulgaris herb oil, eugenia caryophyllus flower oil, pelargonium graveolans oil, boswellia carterii oil, * denotes organic. Apply the Conscious Skincare Bounders Organic Lotion to dry clean skin for the lotion to absorb fully. The light lotion glides over skin with ease and the natural fragrance is pleasant to the senses lasting practically 24 hours after you have applied it. I really like how hydrated skin feels instantly after application and absorbs immediately with little massaging. Light enough to use in the summer whilst also being hydrating and soothing for the winter months, this versatile moisturiser supports any skin type when applied. Conscious Skincare offer individually handcrafted face and body products, using certified organic plant ingredients, fair-trade wherever possible and made in Britain. All of Conscious Skincare products are free from sis, parabens, phtalates, synthetic or chemical preservatives, colours or fillers. The products are full to the brim with skin loving ingredients that the independent cosmetics database in the USA rates Conscious Skincare one of the highest scoring companies for using the safest ingredients. Conscious Skincare also are fully approved by the vegetarian society and their products carry the leaping bunny cruelty-free logo, in addition to being accredited by PETA. Conscious Skincare have the highest regard for the environment with all their packaging made from fully recyclable or recycled material possible. You can choose to receive complimentary gift wrap for most products, with beautiful Eco-natural, 100% recycled cardboard gift boxes and a choice of ribbon finish available, to minimise packaging waste. Affordable luxury skincare, see the full range at Conscious Skincare. X Neil.